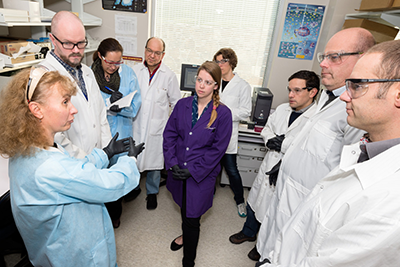 European nanotechnology experts visited the Nanotechnology Characterization Laboratory (NCL) to observe best practices and methods and to share their own knowledge with NCL scientists as they prepared to launch an NCL-like operation in Europe. The European Union Nanomedicine Characterisation Laboratory (EU-NCL) plans to open for business in mid-2016 with funding from the European Commission and support from the NCL and organizations in France, Germany, Ireland, Italy, Norway, Switzerland, and the United Kingdom. Nanotechnology Characterization Laboratory (NCL) staff and European Union Nanomedicine Characterisation Laboratory staff discuss nanomedicine during a recent visit to the NCL. The collaboration intends to strengthen the industrial nanomedicine community, improve communication among international regulators, and reduce the risk of adverse events in the use of nanomedicine, said NCL Director Scott McNeil, Ph.D. The initiative will help spur innovation by linking academia and industry, provide an interdisciplinary testing infrastructure for Europe, and help make nanomedicines more widely available to cancer patients internationally, McNeil said. “The U.S. and the EU share a common enemy in cancer, and cancer does not respect borders,” he said, advocating for more extensive global scientific collaborations to improve treatment options for patients. During their visit in December, 13 scientists from seven European countries took up space in the offices and labs of their American counterparts for a close-up, day-by-day look at both the scientific and practical aspects of nanoparticle characterization in a U.S. national laboratory. By night, they shared large houses at a rural bed-and-breakfast, cooking meals together and comparing notes from the day, helping to solidify their professional relationships. Matthias Rosslein, of the Swiss Federal Laboratories for Materials Testing and Research, who was struck by the beauty of rural Maryland during a previous visit, booked the accommodations. Coinciding with the visit, the Delegation of the European Union to the United States organized an information and networking event in Washington, D.C. The event presented the EU-NCL as an example of a successful U.S.-EU collaboration under the European Commission’s Horizon 2020 funding program. Minister Counselor James P. Gavigan, Ph.D., Head of the Science, Technology and Innovation Section of the delegation, said the European Commission was generally open to funding collaboration with scientists from outside of the union if they offer expertise not already available in Europe, as is the case with the NCL. As EU’s main instrument for funding research and innovation through the year 2020, Horizon 2020 focuses on excellent science, industrial leadership, and societal challenges. Simon Baconnier, Ph.D., EU-NCL transnational infrastructure manager based in the French Alternative Energies and Atomic Energy Commission, said the visit “stimulated a joint-collaborative spirit and scientific alignment,” as the EU experts prepare the EU-NCL to consolidate nanomedicine as part of the health care industry. The EU experts said the visit was a great opportunity to openly discuss technical insights on nanomedicine development, and it helped lay a solid foundation for future joint activities aimed at assisting the next generation of precision medicine. Members of the group, gathered around a meeting table at the Advanced Technology Research Facility, appeared enthusiastic and optimistic. Image: Nanotechnology Characterization Laboratory (NCL) staff and European Union Nanomedicine Characterisation Laboratory staff discuss nanomedicine during a recent visit to the NCL.